This started out as strictly a North Carolina-style barbecue, but over the years it has evolved. The rub is more Memphis, and it helps produce a better “outside brown,” those prized bits of char that get chopped into pork barbecue. The injected brine is Cuban in influence; injecting pork shoulders is all the rage now, and with good reason. It helps keep the pork moist and get flavor from the inside out. At least 1-1/2 hours before you plan to put the pork on, remove it from the refrigerator. Take an injection syringe and pull the mojo up into the tube. Plunge the injector into the pork and then slowly push in the mojo as you move the needle back toward you and out of the meat. You want to do it this way so that you don’t have these huge puddles and so that the mojo is more evenly distributed. Repeat this several more times at random spots until the mojo is gone. When the grill is hot, cut off the center or back burner and adjust your heat to medium-high. Drain the wood chips. If your grill is equipped with a smoke box, fill it with the chips. If not, divide your wood chips among six foil packets, and place one packet at one end of the grill while it preheats. When the grill is ready, cut off all but one burner and turn it to low. Place the pork away from the direct heat. Place a disposable 9×13-inch aluminum pan opposite the smoke source and fill the pan halfway with water. If your grill has a smoke box with its own separate burner, cut off all the burners except that one and turn it to low. Cover the grill and go drink a beer. Typically, smoking chips or even chunks will last 15 to 20 minutes. The pork will gather most of its smoke flavor in the first 2 hours of cooking. Every 20 minutes, working as quickly as you can to keep the smoke from escaping,replace your smoke packet or the chips in the smoker box and add water to the aluminum pan if necessary. When you’ve used all the chips, try not to open the grill again until the barbecue is close to being done, which will take 4 to 5 hours longer. The best clue that the barbecue is done is to take a pair of tongs and grab the flat bone that runs through the center of the meat. If it moves easily or you can pull it out, then the pork is done. 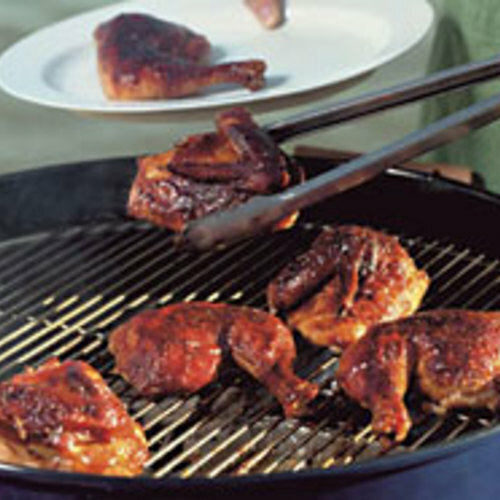 Sometimes in windy conditions or when it’s cold, it can take up to 7 hours for a shoulder to magically become barbecue. The internal temperature should be 180°F to 190°F. When you’ve determined that the barbecue is ready, pull it off the grill into a large roasting pan and let rest for about 20 minutes. Then with forks or tongs, begin to pull the meat so that it comes off in stringy chunks. Separate out the skin and as much fat as you desire. Any of the outside brown, which is crispy, should be set aside and finely chopped, then stirred back into the meat. 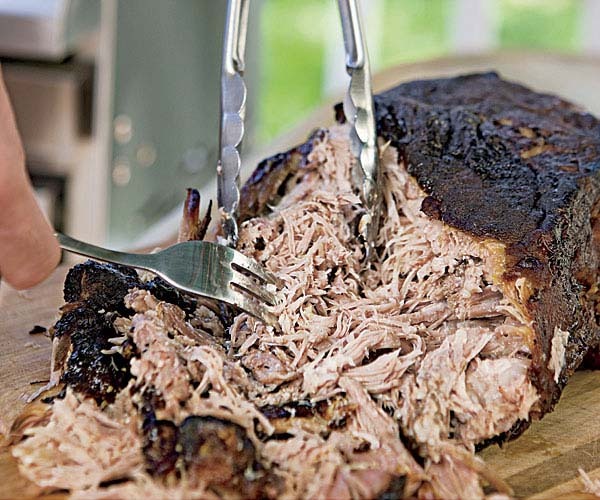 You can leave the barbecue pulled as it comes off the shoulder, or you can chop it a little finer if you desire. At this point I like to sprinkle the pulled pork with the rub that I reserved before using it on the outside, tossing the barbecue to blend. Some people like to sauce their barbecue at this point, and I tend to do that with about 1/2 cup of the barbecue sauce that I intend to serve. Again, toss to combine. Serve hot with cole slaw and additional barbecue sauce on the side. Barbecue reheats nicely in a microwave at medium power. Don’t nuke this stuff full bore or it will dry out. Another way I like to reheat pork is to put about an inch of water in a 3-quart saucepan and then insert a vegetable steamer. As the water begins to simmer and steam, pile the barbecue on top of the vegetable steamer and cover. Steam the ’cue for 5 to 10 minutes or until heated through.